Half the fun of Christmas is being able to eat what you want, when you want. After all, that box of chocolates isn’t going to eat itself. And it would be a waste to throw away those mince pies that are cooling in the kitchen. If you can’t overindulge during the festive season, when can you, eh? But it’s the same every Christmas. You stick two fingers up at healthy living, and then, come the new year, you mope and groan as you struggle to fit into your favourite pair of jeans. This year, why not try a different approach and make a conscious effort to choose the right foods? It needn’t be as difficult as you think. Here are a few healthy festive foods that not only taste great, but aren’t too bad for you. We’ve also included some cooking tips that cut down the number of calories you’ll consume, as well as finding ways to make sure those Yuletide treats fuel your festive rides. Everyone loves a mince pie or six at Christmas. It wouldn’t be Christmas without them. Unfortunately, they are full of sugar and calories. Supermarkets have tried to cut down on the amount of calories in each pie, but unless you are only going to eat one over Christmas, the mince-pie-related intake will begin to show on the waistline. Instead of shunning them, why not use them as your bike riding fuel? An average supermarket mince pie contains 265kcal, 2.75g of protein and a whopping 40g of sugar! In fact, these pies contain more carbohydrates than many energy bars, making them perfect for fuelling a brisk morning ride. The downside is they are also very high in fat and sugars, so moderation is advised. 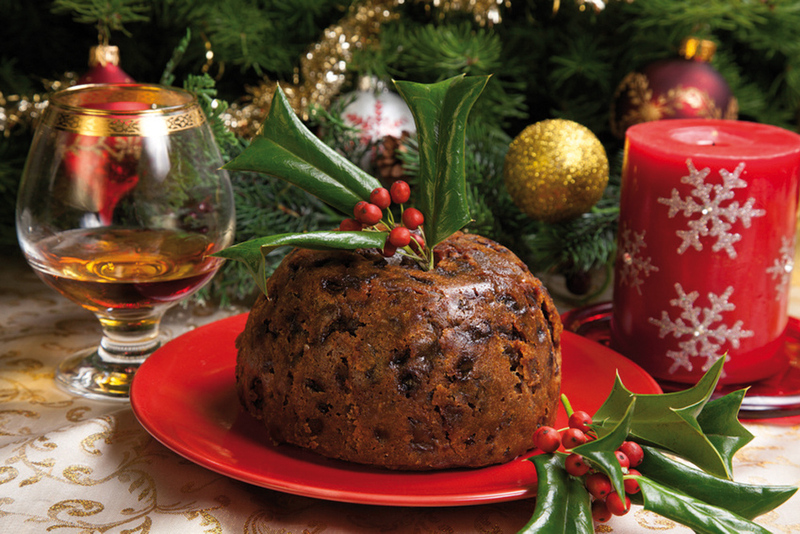 On its own, Christmas pudding is actually fairly low in fat and rather high in carbohydrates. Stick a piece in your winter jacket pocket for your ride and, once gobbled mid-ride, you’ll be flying. It also contains B vitamins, potassium and calcium. The problem starts with the optional extras such as brandy butter, cream and custard. Just one tablespoon of brandy butter has 81kcal and 5.8g of fat (3.9g saturated), while two tablespoons of double cream has 133kcal and 14.2g of fat (8.9g of it saturated). Double trouble! Luckily you can swap these out for much healthier options, without a huge sacrifice in the taste stakes. Three tablespoons of custard contains 27kcal and 0.6g of fat. Two tablespoons of zero per cent fat Greek yoghurt contains 16kcal and yep, you’ve guessed it, zero fat. Christmas nuts: seek an alternative! No matter where you go at Christmas, you can’t help but be tempted by the lure of a bowl of salty peanuts. They’re everywhere. They present themselves on living room tables, tease you from the mantelpiece or loiter in the dining room just waiting for you to inevitably grab a handful. 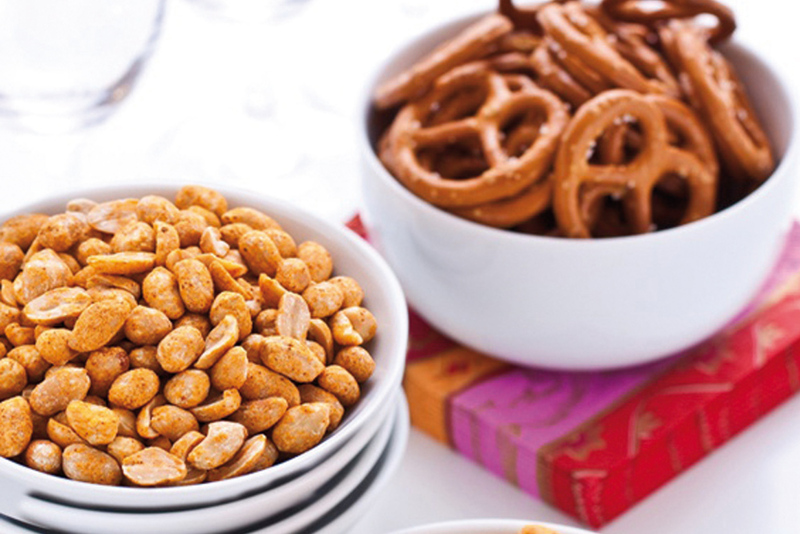 It is these snacks, which you may think are harmless at the time, that cause the trouble — a handful of salted peanuts contains 184kcal and 15.g of fat! There are a few options you can try. Either ignore them, or buy something else. A handful of pretzels, for example, contains just 114kcal and only 0.4g of fat. Turkey is the daddy of the Christmas dinner. Everyone — well, meat-eaters anyway — are able to indulge in a huge helping of turkey, totally guilt-free. And the best bit is, it’s good for you. Turkey is high in protein, making it a perfect food to aid recovery after exercise. It also contains B vitamins, which the body needs for energy production. The only drawback is that it contains fat. Still, most of this fat is found in the skin. Did you know that if you remove the skin from the turkey, you could save up to 40kcal per serving? Light meat also contains fewer calories than dark meat, so when you’re given the choice, opt for breast instead of the leg or the thigh. When the turkey is being cooked, pierce the skin to allow the fat to drain away. Cook it on an overturned plate, so that it’s not bathed in its own fat. No Christmas dinner is complete without roast potatoes. Potatoes are virtually fat-free and rich in carbohydrates, making them ideal for pre-ride fuelling. It is only when you roast them in oil or fat that they turn ‘evil’ and threaten your figure. Roughly, 100g of potatoes roasted in oil contains 149kcal and 4.5g of fat (0.5g saturated). Try swapping them for baked potatoes. OK, they may not have the crispy crunch of a traditional roast spud, but you’ll be consuming just 109kcal and 0.1g of fat from the same serving size. Everyone loves a good dip at Christmas. However, it doesn’t take too many dunks into the sour cream and chive bowl before you’ve thrown away all of the hard work that you’ve been putting into skinning the turkey, swapping the potatoes and ignoring the peanuts. Alarmingly, just two tablespoons of sour cream and chive dip contains 110kcal and 11.3g of fat. Push it to one side and dunk whatever it is you’re dunking into a bowl of salsa instead, which contains a puny 20kcal and only tiny traces of fat.